Isn't it strange, I was reading about why a "blue moon" is called a blue moon yesterday, and lo and behold we have one today. Though it's cloudy and you can't see it! A blue moon is the second full moon in a particular month. As this only occurs once every 2.75 years or so, hence the saying "once in a blue moon". The reason is that the moon's cycle is 29 days, whereas months are mostly 30 or 31 (except Feb of course), so eventually the date of full moon fits twice within a month. So I decided to do a bit of Moon digiscoping! I know this isn't quite full moon but you have to do this when the sky is clear! For digiscoping you don't need too much equipment. You can use your compact camera - in fact I have read that compact cameras are actually better for this than DSLRs in some respects, although you need a long shutter speed for anything really remote, like nebulae etc (and an equatorial mount but I can't afford one of those just now!). You also need a camera mount for the telescope - about £20. The telescope btw was about £50 off eBay, it's a 75mm objective with a 25mm and 9mm lens and 3x Barlow Converter. So it gets some decent stuff for casual viewing. And it's the right way up so I can digiscope wildlife as well. 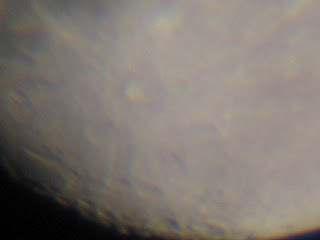 The above is a close up of Tycho, a crater near the base of the moon. Notice the white rays coming off it, which are streams of material ejected when the meteorite impacted the moon's surface. These rays are common to a few craters such as Archimedes and Plato in the north west quadrant of the moon (viewed right way up), and are only really spectacular near the full moon, whereas for crater spotting you probably need a much less full moon to get the shadows etc. 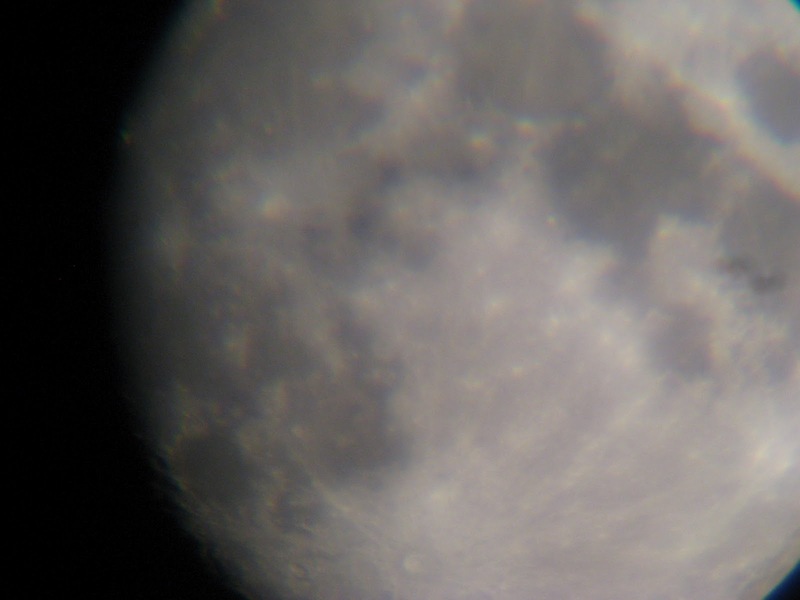 The difficulty with digiscoping is setting the telescope up first, even though the moon is pretty big in the sky you would be surprised how difficult I found it with a 9mm lens to pinpoint it. Plus it moves in the few minutes it takes to point the telescope the right way! Before I got the camera mount I took video to compensate for camera shake and telescope shake, and also before I found the setting on the compact camera (a Canon) to delay a photo for anything up to 2 or 3 minutes - though 20 seconds is usually enough.